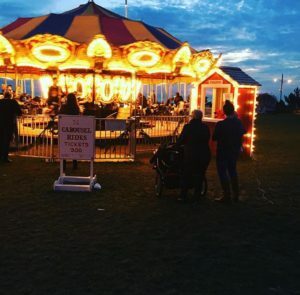 This is a listing of the FREE, or Low Cost Family Friendly Cape May County Holiday Events for 2016. Please check all listing for times, fees, and age requirements. Phone numbers and website links are listed for your convenience. Check out Dining with Santa and Friends listings and other holiday fun like Live Nativities, and the TV Holiday Lineup. Calling all Kids, big and little, to create a Gingerbread House and enter for a chance to win a wonderful prize! The Flanders tradition continues with our annual Gingerbread House Contest. Anyone may enter, categories for adults and children. Bring your creation to the Flanders between November 25th and December 30th. Judging will be on January 1st, 2017 at 12 noon. Every children’s entry receives a gift. Free photos with Santa! Free activities for kids such as crafts, big dig excavation area, Lincoln Log Building area, remote control trucks, foam toy arcade, laser arcade & so much more! Check website for compete details. Ages 18 months – 5 years. Pre-registration required. Please call to register! 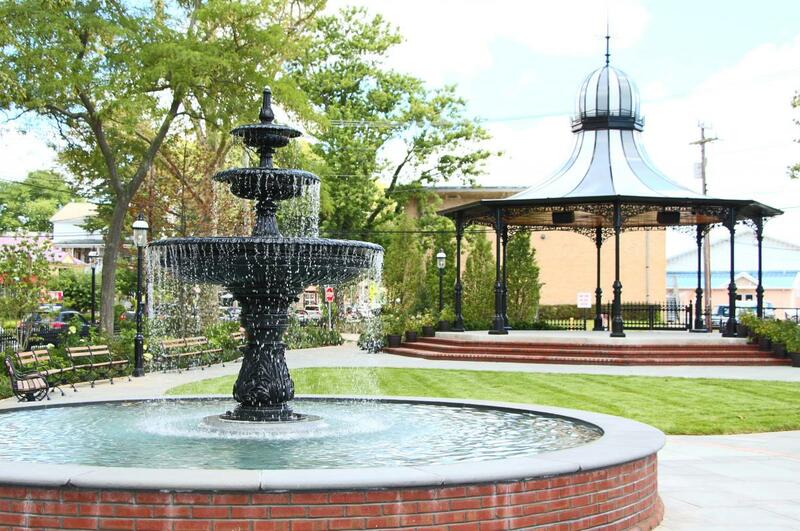 Festive ceremony will take place at the Hereford Inlet Lighthouse Courtyard, 1st & Central Avenues, in North Wildwood. 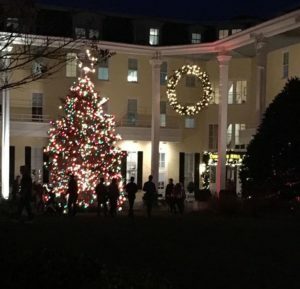 Christmas tree lighting event includes music, cookies, hot chocolate, and Santa Claus! 5:30 p.m. – 7:30 p.m. Free admission. Fun for the whole family. Mechanic Street & Municipal Parking Lot. We will be hosting our annual Christmas Parade on December , 201 at 6:00pm. The parade begins in the Acme parking lot, with participants arriving at 5:00pm. From the Cape Savings parking lot we will proceed south on Route 9 starting at 6:00pm. Judging will be in front of the Bellevue Tavern. We The parade will make a right onto Hand Ave and proceed to Boyd Street, then make a right onto Boyd Street and go to the tree lighting ceremony at Township Hall. Santa will light the tree. Everyone can follow Santa back to the Firehouse. Santa will be giving candy canes, Mrs. Clause will be reading Christmas Stories and the Middle Township Volunteer Fire Department will be serving hot beverages and cookies for our guests. Fun for the whole family. 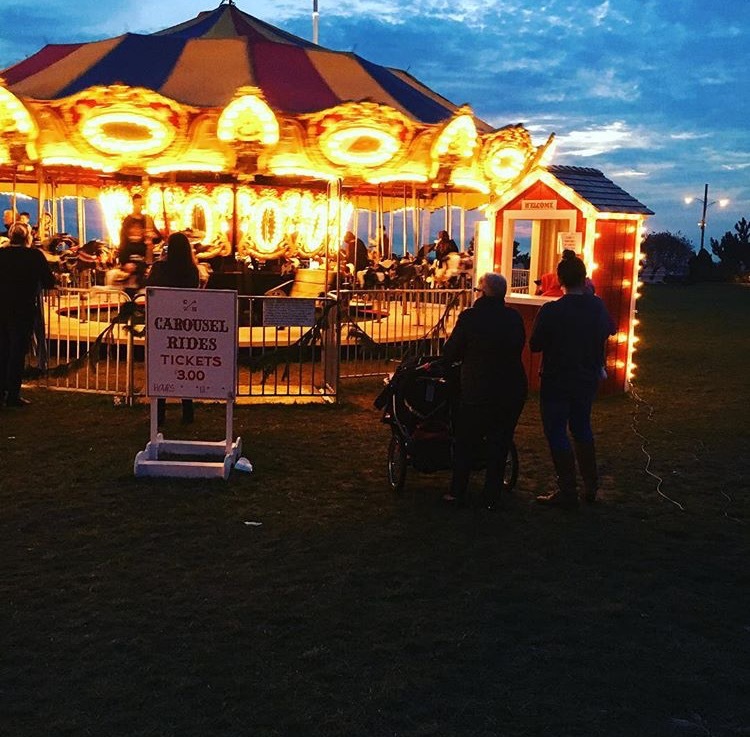 Enjoy some old fashioned holiday cheer when the City of Cape May officially kicks off the holiday season on Friday, Dec. 2nd at 7 p.m. with the annual Tree Lighting Ceremony, at the newly renovated Rotary Park Bandstand. The Bandstand is located on the 400 block of Lafayette Street. 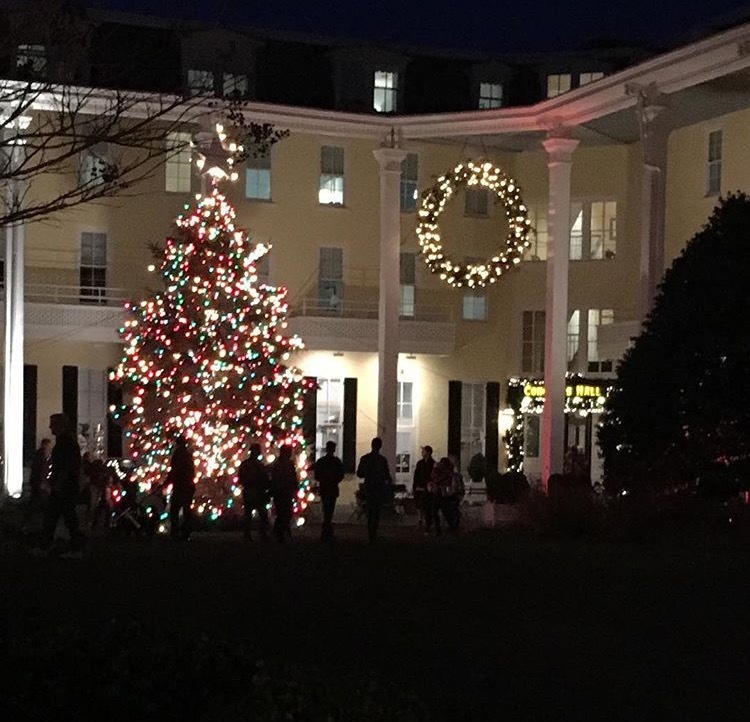 The holiday family program will include caroling, a presentation from the LCMR chorus and a special visit from Santa Claus. 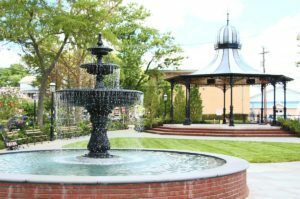 Cape May City officials and representatives for the Chamber of Commerce of Greater Cape May, and Mid-Atlantic Center for the Arts & Humanities will also be present for the ceremony. Shore Road from Dawes Ave. to New Jersey Ave. and up to City Hall. This festive, annual parade will lead Santa Claus down Shore Road from Dawes Ave. to New Jersey Ave. and up to City Hall. Festive floats, live music and groups from the community and school will march. NEW this year is a float-decorating contest don’t miss the excitement! Mayor Jack Glasser and Santa Claus will light the tree after the parade concludes. Inside City Hall, Santa Claus will meet with children for pictures while his elves give out special treats. Caroling performed by the Mainland Tri-M Choral. Special Thanks to the Somers Point Volunteer Fire Companies. Ocean City Asbury Ave & 12th St. COST: Pre-registration $20.00 received by Nov. 28th . $25.00 day of race. Race time 5:30pm. A one-mile race. Starting on Asbury Avenue at 12th Street. Race-day registration is 4:30 p.m. at the 12th and Asbury parking lot. Event is sponsored by the Ocean City Track and Field Boosters. Proceeds benefit the Boosters and Ocean City Food Cupboard. For more information on pre-registering and other questions, please call (609) 398-8277. Divisions include Santa Scamper (Open to anyone festive enough to run/finish the race dressed in Christmas attire.) (i.e. as Santa, Mrs. Santa, an Elf or Reindeer or a reasonable/acceptable facsimile) Prizes will be given to the five best costumes. All runners are eligible for door prizes. All participants must be present & have their race bibs to be eligible for prizes. Please ‘NO pets, bicycles, roller blades, skateboards, skis or sleighs. Ocean City’s annual CHRISTMAS PARADE will start at 6:30 p.m. on Friday. Route march from 6th Street to 11th Street on Asbury Avenue. It will include the Ocean City High School Marching Band, Pitman High School Marching Band, Pennsport String Band, Absegami High School Marching Band, and the Original Hobo Band of Pitman, and Erica Reichert, Collegiate Miss Majorette of N.J. There will be an array of colorful entries accompanying Santa Claus, who will ride into town via horse-drawn carriage. There will also be floats and costumed characters in the event. After the Parade Santa will meet youngsters at the gazebo, in Mark Soifer Park, across from City Hall and pose for photos. The Episcopal Church of the Advent in Cape May will hold a Christmas Bazaar and Luncheon on December 3 from 9 until 2 in the Parish Hall at 612 Franklin Street. The Bazaar is a real old-fashioned church fair with no outside vendors. Everything is made or donated by the people of Church of the Advent. Join our hands-on workshop where your child can create a festive Gingerbread Man Candy Dish. All kids get to keep their craft, receive a FREE certificate of achievement, a Workshop Apron, and a commemorative pin while supplies last. Children must be present at the store to participate in the workshop and receive the kit, apron and pin. They craft; you shop! Kids 3 and up can enjoy a sprout stocking project. Sign up online, in-store or just drop in. $2 per project, supplies included. Parent or guardian must remain on premises during the event. Enjoy dozens of crafters and their wears, so you are sure to find all the perfect gifts you’ve been searching for. Get a glimpse of Santa as the Ocean View Fire Company Candy Cane Drop will begin at 10am this Saturday December 3rd. Below is Santa’s Approximate route. Leaving the Fire House at South Seaville will then head down Woodbine Blvd to Gracetown Road. Heading West on Dennisville Road to sunny lane down to Hagan Road to Route 9. Traveling North on Route 9 to Landing road, Raven Wood East continuing to cedar Drive and Alexandria Way. Santa then will continue on Academy to kings highway on to Timothy lane, through Ravenwood , North on kings highway to tattlers road. North on Dennisville Road to Main Street hitting side streets on the way, continuing North on Route 9 to Route 550 and side streets to Corsen Tavern road turning around at Outdoor world, Santa then will travel South on Kings Highway finishing at the South Seaville Fire House. Please Keep an Eye on Facebook for updates of Santa Location! COST: Admission is $3 for adults and $1 for children. December 3rd & 4th ‘“ Train Show ‘“ NEW LOCATION: Ocean City Sports & Civic Center, 6th & Boardwalk. 10am- 5pm Saturday and 10am -4pm Sunday. Admission is $3 for adults and $1 for children. For more information call 609-399-6111. Join us for our super popular hand crafted Christmas ornaments! First visit as scheduled…glazing date your choice. Family workshop Saturday, December 3rd 1st session 10:30-11:30 & 2nd session 4-5 Family Workshop $10 pp 2 ornaments each. Please call 609-398-8880 to register. Pre-registration required. Register for a free clinic at Lowe’s. Build a wooden project and get a free apron, goggles, and patch! Featuring: Chinese Auction, 50/50 Raffle, Demonstrations, Snacks and Beverages Photos With Santa: Photo with Santa for a $5 donation (includes beverage and hot dog for every child in photo). Free photo with a donation of a new unwrapped toy. At The Door: Donations will be accepted for Food Bank, Toys for Tots and the Humane Society of Atlantic County. A Christmas Tradition continues… The Seashore Lines provides a historic, comfortable and fun train ride with Santa Claus, as he returns to visit with children (young and old) on board THE SANTA EXPRESS! Online reserved ticket purchases are highly recommended. Seating aboard all THE SANTA EXPRESS! trains are primarily limited to passengers who have purchased their tickets online. A very limited number of “walk up” tickets for each of THE SANTA EXPRESS! trains may be available at each station prior to train departure. They are solely on a first come basis, and, only if seats are available on the next departure. Walk-up tickets will not go on sale until all ticketed passengers are seated and it is determined by the Conductor that space is available. December 3rd & 4th ‘“ Train Show ‘“ NEW LOCATION: Ocean City Sports & Civic Center, 6th & Boardwalk. 10am ‘“ 5pm Saturday and 10am ‘“ 4pm Sunday. Admission is $3 for adults and $1 for children. For more information call 609-399-6111. New in 2016! Physick Estate Scavenger Hunt: Go on a clues hunt and discover answers to questions as you search the grounds of the 1879 Emlen Physick Estate, 1048 Washington St. Purchase a packet for $5 that includes a clue sheet and ponder the answers as you explore the estate grounds as a family. Learn together about Cape May’s only Victorian House Museum – one of the best examples of Victorian Stick Style architecture in the country. Available daily, year-round. Costs $5 per packet (only one packet is needed per family). Sponsored by the Mid-Atlantic Center for the Arts & Humanities (MAC). For more information, call 609-884-5404 or 800-275-4278 or visit www.capemaymac.org. Bring your favorite pet in for a keepsake photo with Santa available on December 4, 11 & 18 from 11am-6pm. Plus, a portion of the proceeds will benefit the Atlantic County SPCA. (All pets must be in a carrier or on a leash). Bring the kids to the Physick Estate on weekends for a ride around Cape May with stories and songs led by Mrs. Claus. Santa will greet children with a sweet in the Carriage House. Tours are 30 minutes long. Click on “website link” to purchase tickets for specific times. Adults $10; Children (ages 3-12) $8. Advance reservations are strongly recommended Purchase tickets at the Washington Street Mall Information Booth at Ocean Street or at the Physick Estate at 1048 Washington St. at the Carriage House or the Hill House Office. The Ocean City Regional Chamber of Commerce has invited Santa Claus to Ocean City for photographs. 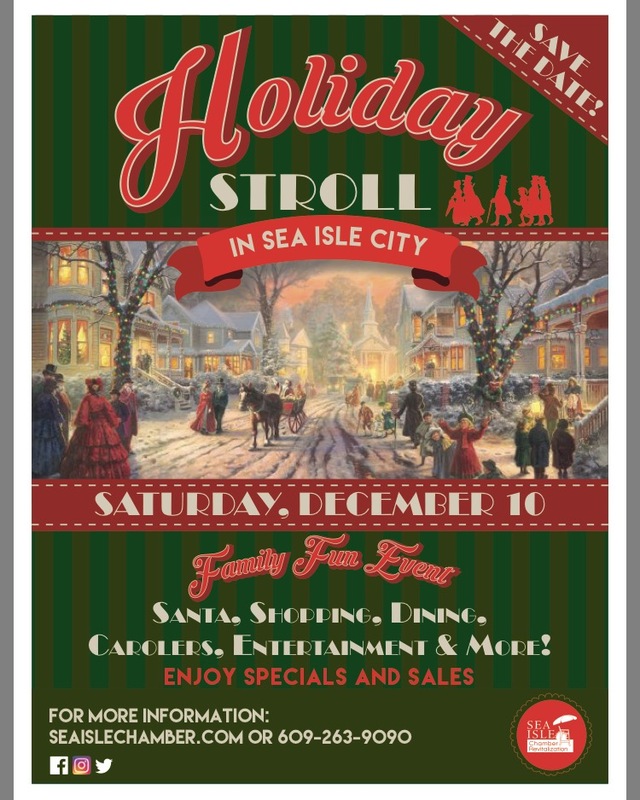 Photos will be taken between 5th and 6th Streets on the Boardwalk (weather permitting), with Santa in an official Ocean City Lifeguard Boat. Please note, this is a new location due to Boardwalk construction. Santa Claus will be in town on Saturday’s & Sunday’s from noon to 3pm beginning November 26th. Cost is $10.00 per photograph. For more information please call 399-1412 or visit www.oceancityvacation.com. Bring your pet for a great photo with Santa! Beautifully executed as always at a calm, private location in our store. Come join our education staff for an extra special animal craft project.Guest critters will be on hand to help! This program will be held every Sunday afternoon beginning October 9th from 1:00 to 3:00 pm. Ages 3 to 10, parents/caregivers are welcome! Crafts with critters will be held at the Education Station just outside the zoo entrance. No registration is necessary, just drop by! Only $5 per child/craft project. Turn ordinary gingerbread houses into culinary works of art. Make your very own sweet creations in Congress Hall’s Grand Ballroom with the help of some of Santa’s finest Elves. Kids will get a gingerbread house with plenty of icing and candy like gum drops, peppermint, jelly rings and more to decorate a personalized Christmas cottage. Reservations are $25.00 per house Limited space is available. Sessions run every half hour from 1:00 pm through 3:30 pm Call (609) 884-6583 for reservations! Goshen Volunteer Fire Company will be hosting their annual towns Christmas celebration with light refreshments and a visit from the big guy himself. SANTA CLAUS!!! So, bring your cameras and snap a memory of your little ones receiving a special treat from Santa!! As always, from our family to yours have a very safe and healthy Holiday Season!! The Winter WonderFest features a 2-mile drive through Cape Henlopen State Park with a series of light displays along the way. Up the road at the ferry terminal, a Christmas Village includes a synthetic ice rink for outdoor skating, Santa, crafts, Smores fire pit, music and a full-size Ferris wheel among other things. Continue a family tradition with an exciting holiday celebration filled with fun for the entire family! Attend the Jaycees Christmas Parade on Friday night at 6:00 p.m., followed by a tree lighting ceremony and parade awards ceremony at the Wildwoods Convention Center at 7:15 p.m. Bring the family inside the Wildwoods Convention Center lobby on Saturday from 9 a.m. – 4 p.m. for FREE admission to holiday-themed crafters and movies, photos with Santa, entertainment and much more! 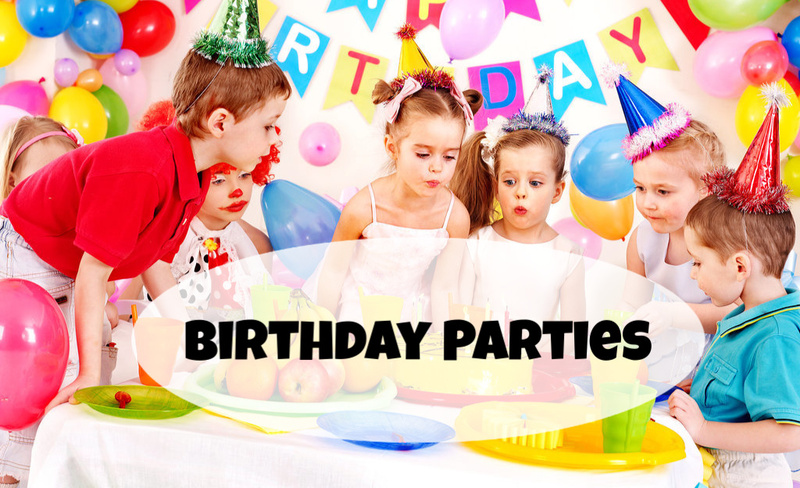 For more information call 609.729.9000 or visit http://www.WildwoodHoliday.com for a detailed schedule of events. COST: $30 per person or $15 if you donate a new, unwrapped toy for local children in need. This holiday boardwalk 5K run and 1 mile walk is fun for all ages! Event starts at 10 a.m. – rain or shine – registration begins at 9 a.m. inside the Wildwoods Convention Center. Participants are encouraged to dress in festive holiday outfits. The race route will run south on the Wildwoods Boardwalk to Cresse Avenue, make a turn around and head north to 21st Street. Another turn will lead runners back to the Convention Center where refreshments will be served and prizes awarded. Runners and walkers along with their cheering sections can then enjoy the Holiday Bazaar held inside the Convention Center. Registration is $30 per person or $15 if you donate a new, unwrapped toy for local children in need. For more information call 609.849.8887 or visit http://www.LunchWithLynch.com/pinch. They craft; you shop! Kids 3 and up can enjoy a clay pot elf project. Sign up online, in-store or just drop in. $2 per project, supplies included. Parent or guardian must remain on premises during the event. On Sat., Dec. 10, 2016, the Borough will be hosting its annual Christmastime parade, sponsored by the Woodbine Volunteer Fire Company. The parade will begin at 6 p.m. and line up will start at 5 p.m. along Bryant Street. The parade route will be the same as on previous years: starting on Bryant head south onto Washington continue to Clay Street, head east on Clay to Heilprin Avenue continue north on Heilprin then proceed west on DeHirsch Avenue stopping at the Firehouse. Santa will join the Mayor in lighting the Christmas Tree on the bikepath and then conclude the evening at the Firehouse where refreshments will be served and trophies awarded while Santa visits with the children. (Please: no other “Santas” present in the various floats, etc.) Categories for prizes will be: Best appearing Fire Company, Best appearing Rescue Squad; Best appearing Float; Best Marching Unit. “We invite all local fire, rescue, and other first responders, as well as marching bands, floats, and other organizations to register and participate in this seasonal celebration,” invited Mayor Pikolycky. For further information and to register call Jeanette at (609) 861-2464; if no answer please leave message. $25.00 per seat All Ages Welcomed! Please pre-register! Bring the kids to the Physick Estate on weekends for a ride around Cape May with stories and songs led by Mrs. Claus. Santa will greet children with a sweet in the Carriage House. Tours are 30 minutes long. Go to the website to purchase tickets for specific times. Adults $10; Children (ages 3-12) $8. Advance reservations are strongly recommended. You can also purchase tickets at the Washington Street Mall Information Booth at Ocean Street or at the Physick Estate at 1048 Washington St. at the Carriage House or the Hill House Office. Santa will be making a visit to the Cape May County Park and Zoo! Freeholder E. Marie Hayes and the Board of Chosen Freeholders invite the public to take a photo with Santa and Mrs. Claus during “Santa’s Family Workshop” on Saturday, December 10th from 11 a.m. until 2 p.m. This free, family event, hosted by the Board of Chosen Freeholders, will also include crafts, education stations, entertainment and special animal themed gifts for sale. Santa will be dropped off by his reindeer from 11am-3pm at Woodland Village so grab your little ones and get your picture taken and maybe a candy cane too! Santa is arriving by fire truck on December 10th! Join us for refreshments, hot apple cider, kids crafts and fun for the entire family! 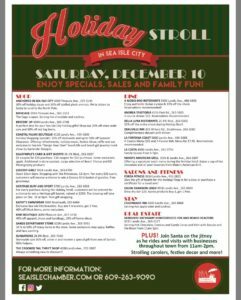 Santa, Shopping, Dining, Carolers, Entertainment & More! 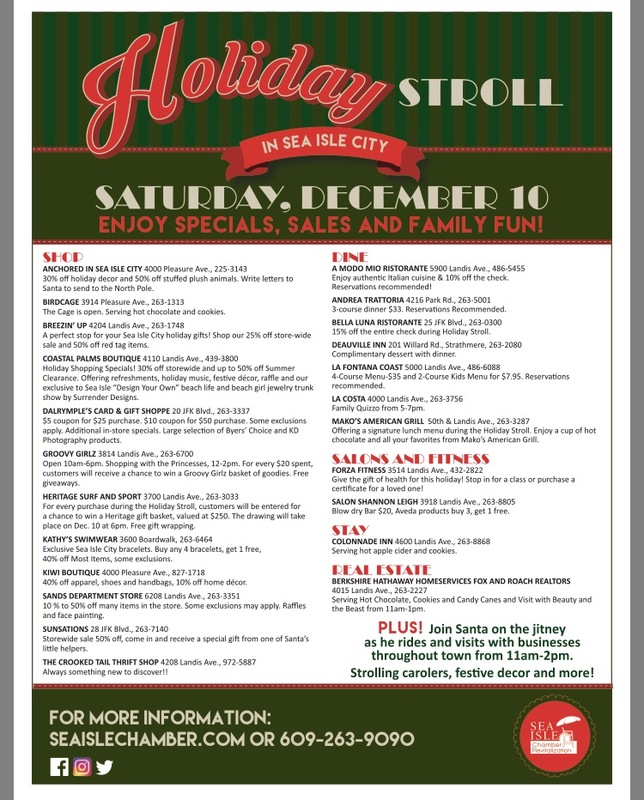 Check off something for everyone on your list this year as you stroll through Sea Isle City on Saturday, December 10 to get your holiday shopping done! Browse through a variety of Sea Isle City businesses featuring discounts and hospitalities as we debut this brand new event! Santa arrives at 11 am along with the carolers, they are arriving at Excursion Park then for a few songs then they will be strolling around Sea Isle. Each of the businesses will be open their own independent hrs. Happening Saturday’s & Sunday’s through December 18th! Head onover to Ocean City for FREE Horse & Carriage Rides! Rides happen from Noon’ 3pm, in front of City Hall, 9th & Asbury Ave. For more information call 1-800-BEACH-NJ. The Ocean City Regional Chamber of Commerce has invited Santa Claus to Ocean City for photographs. 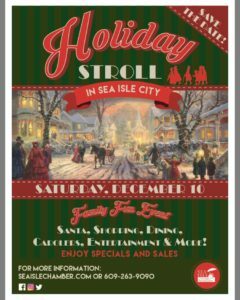 Photos will be taken between 5th and 6th Streets on the Boardwalk (weather permitting), with Santa in an official Ocean City Lifeguard Boat. Please note, this is a new location due to Boardwalk construction. Santa Claus will be in town on Saturday’s & Sunday’s from 12 noon -3pm cost is $10.00 per photograph. For more information please call 399-1412 or visit www.oceancityvacation.com. 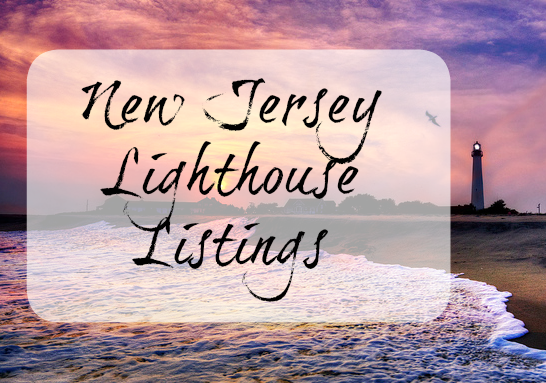 Absecon Lighthouse will light up the holidays on Saturday, December 10th, from NOON to 3:30pm. Mrs. Santa Claus and their Lighthouse Elves will host kids of all ages for holiday crafts in the museum, a climb to the top to meet Santa Claus, and pizza from the award winning restaurant Tony Boloney’s. Guests will enjoy the official lighting of our Holiday Tree at 1pm, and have a chance to do some holiday shopping in our charming gift shop. Tickets are just $10 for adults and $5 for kids ages 4-12 and can be reserved by calling Absecon Lighthouse at 609-449-1360. All proceeds benefit the education programs at Absecon Lighthouse.